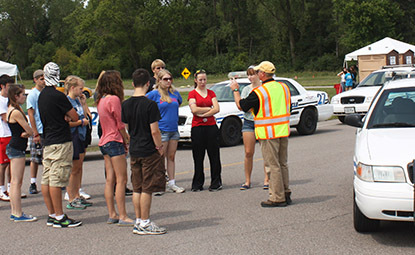 The Traffic Safety Education/Drivers Education program will prepare you to teach driver’s education in a public, private or commercial school setting. You will learn how to teach students important life skills while improving your own driving skills. The program combines theories of instruction with practical application. You will do well in the program if you are a K-12 teacher looking to obtain driver education licensure or a licensed driver education instructor looking to update your knowledge and skills. Designed for full-time or part-time students. The five-course program is designed to be completed in one to two semesters. All coursework can be completed through distance education including 90 percent online courses and 10 percent ITV courses. Meets the requirements of the Minnesota Board of Teaching, students attending from other states must check with their own state for specific licensure requirements. Undergraduate coursework available for commercial driver education schools or teachers not seeking pay lane changes. Meets the requirements for licensure set by the Minnesota Board of Teaching, the Minnesota Department of Public Safety Driver Education Unit, the American Driver and Traffic Safety Education Association and the Minnesota Driver and Traffic Safety Education professional organizations. Accredited by the Council for the Accreditation of Educator Preparation and the Minnesota Board of School Administrators — students from states other than Minnesota should check with their own state for specific licensure requirements. Graduates come from throughout the United States including: Alaska, Arkansas, Florida, Illinois, Kansas, Michigan, Minnesota, Montana, New York, North Carolina, North Dakota, Oklahoma, South Carolina, South Dakota, Virginia, West Virginia, Wisconsin and Wyoming.